Game 4: A Wish-aw Come True; 4 & 0! A very muggy day met the Roughnecks in Wishaw, for the second of three meetings with the Clyde Valley Blackhawks. Beltane Park was the venue, and the Roughnecks were looking to make it 4 straight wins for the first time. Winning the cointoss, we elected to receive and set to work on offence following a long kick-off return from #18 Rhys Elmslie. Having gained a couple of first downs, it would be the Roughnecks who would score first, as kicker, #4 Stuart Don would make it 3 - 0 with a 43 yard field goal as the first drive of the day stalled with 26 yards to paydirt. The offence wouldn't have the same problem on the next drive as QB #16 Chris Breen's long pass would find WR #18 Rhys Elmslie in the endzone for Rhys' second score of the year. The defence held strong throughout the first quarter, and an interception for #42 Remi Theron would set up the offence in great field position to allow Rhys and Chris to find the endzone again; #18 from #16 and the score was 17 - 0 with the two PATs added on with the minimum of fuss. The Roughnecks defence would continue to hold Clyde Valley at bay for the remainder of the half, and a combination of the defence, and special teams would add the only other score of the half, through a safety on fourth down making it 19 - 0, with DL #69 Andy Watts taking the QB/Punter to the ground in his own endzone. It would be another safety to start the scoring in the second half, in very similar fashion, this time DL #56 Matt McCall capitalising on a poor snap as the Blackhawks tried to punt the ball out of the back of their own endzone again. 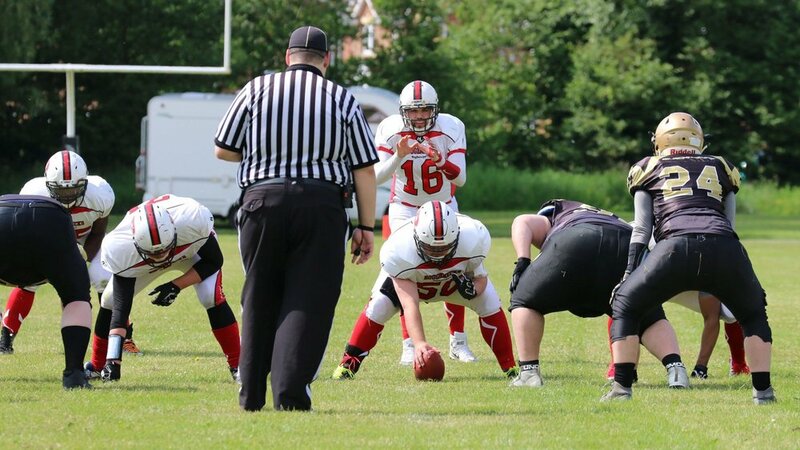 The offence would continue to move the ball all game, scoring another touchdown on the brotherly connection between #16 Chris and #1 Sean Breen through the air, deep inside the redzone. 28 - 0. The Clyde Valley Blackhawks would continue to play hard throughout, refusing to give up and added two touchdowns of their own, both caught by #81, either side of another Roughneck field goal this time from 33 yards out. Making the final score 31 - 14, with one successful 2PAT following a failed PAT attempt which lead to a Matt McCall fumble recovery. The game would finish with the Roughnecks kneeling out the game to move to 4 & 0, with a interception for #4 FS Stuart Don. Extremely proud of the team going 4-0 and getting our first away win against CVB. The offence was electric to start with and showed that they are improving every game as they finished drives off in the redzone, which was something we have struggled with this season. The defence dominated in the first half and coped well in the second half with the adjustments made by CVB. It's now on to Dumfries in two weeks time where we will be looking to continue our strong form and get to 5-0. The game started off well from a defensive point of view and had a lot of positives throughout the day. We have started scoring on defence again and helping the offence out with turnovers in advantageous positions. Some huge performances from guys stepping into the starting defence for the first time in absence of others. Preparations for Dumfries have begun to ensure we go 5 - 0. Defence: Daire O'Beirne. Daire was everywhere on defence today, making many important tackles to get the offence back on the field, and send the Blackhawks backwards. Bud Light MVP: Rhys Elmslie. A two touchdown performance, and some excellent kick-off returns really provided the impetus for the win.